At this year’s HIGH END festival Naim introduced, among other things, the NAC–N 272 and the amplifier NAP 250 DR, a combination that the German Naim Musicline touted as “the best all-in-two system in the world” describes, The NAC–N 272 provides streaming via UPnP or online via web radio, Spotify or TIDAL (The latter even in CD–quality), digital and analog inputs and convenient operation via a Android / iOS app. The output stage has NAP 250 D R benefits from technology derived from the Reference Series Statement, and lifted the amplifier sound to an unexpectedly high level. Since the early 70s Naim develops and manufactures amplifiers in southern England; they’re known for their natural and vibrant sound. Later, CD players were added, and in 2008 the first Naim product with a network Beech: the music server and hard disk player HDX, which is still produced in a developed form. Since Naim has its expertise in digital technology and streaming expanded steadily and has become one of the leading high-end manufacturers in the field. The NAC-N 272 is the latest network-enabled product from the Englishman. Its features include a UPnP streamer (up to 24 bit / 192 kHz), Bluetooth / aptX for making a wireless connection with smartphones and computers, analog and digital inputs for external sources, a radio, Spotify Connect and native TIDAL support. The NAC-N 272 can also be supplemented by an optional FM/DAB module. Since the release of a new firmware version a few weeks ago TIDAL is not only on the 272, but on all networks and all-in-one players Naim available. The online music service is available in Germany since April and has in contrast to the top dogs Spotify not only compressed but also lossless streams in FLAC format (16-bit / 44.1 kHz). TIDAL is seamlessly integrated into the Naim own Android and iOS app, so you can search directly from this out the TIDAL deal and put titles into the queue. Connects to MP3 players or USB sticks is on the front panel USB input. A 6.35-mm headphone output with Class A single-ended circuit completes the offer. However, the diversity of features should not distract from the fact that the sound quality during the development of the NAC-N 272 in the foreground. So has the S1 derived from the reference NAC volume control a higher signal fidelity than the previously favored by Naim Alps potentiometer. The 272 also uses the same DSP chip, which comes in the reference player NDS for use, and benefits from established Naim principles as a large-sized toroidal transformer with multiple windings, highly selected components and the mechanical decoupling of components. 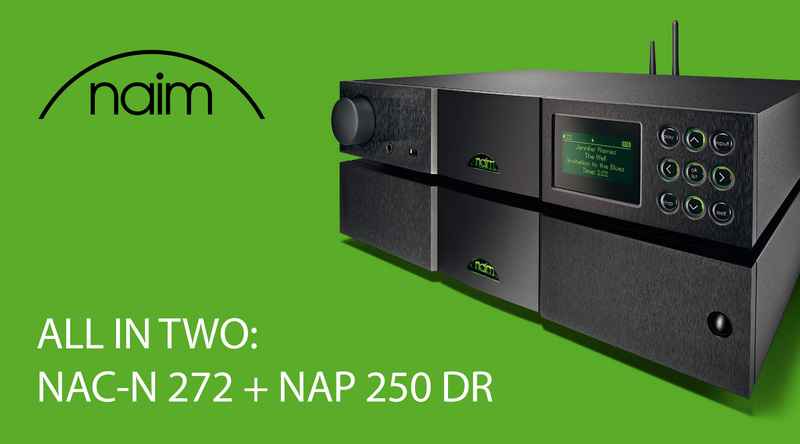 As an ideal partner for the 272 of Naim distribution lists the updated version of the classic amplifiers-NAP 250, now equipped with the suffix “DR”. The shortcut points to the use of fully discrete voltage regulator, by a thirty times higher signal to noise ratio, faster response to load changes and about ten times lower ripple distinguished from than previous controllers. In the NAP 250 DR also come new, extremely powerful output transistors used. Imports coming from the Statement series, “009” baptized transistors were developed in collaboration with a highly specialized semiconductor manufacturer. During the production process, the semiconductor wafers are provided with serial numbers and pairs matched, because the closer are two pads on the silicon wafer, the less soft their properties from one another. Housing and Connectors of 009 transistors are made of non-magnetizable material in order to reduce vibrations that may arise due to the strong current flow in conductors in parallel (Ampère’s circuital law). Ceramic plate between the transistor and heat sink electrically isolate the components and ensure efficient dissipation of heat. These innovations come from the summer in several classic Naim amplifiers into play to ensure a significant increase of performance and sound quality. The comparatively compact high-end combination of the NAC-N 272 and NAP 250 DR represents our view is by the best of what is currently available in this product category. Listen strongly recommended! This article is a guest post by Music Line.